Photo: Dr. Marko Hoare, renowned British historian. The justice or injustice of a cause may in large part be measured by the ethics displayed by those who uphold it. The ongoing campaign to whitewash the former regimes of Slobodan Milosevic and Radovan Karadzic and to justify their genocidal crimes against the Bosniaks is about as unworthy a cause as it is possible to imagine; consequently, the people who wage it do so in the most dishonest and malicious manner possible. Their campaign is fundamentally an expression of hatred – for Bosniaks, Croats, Albanians, anti-fascist Serbs, Jews and others who opposed the genocide. So their tactics are of the most hateful kind, involving systematic character assassination and racist and anti-Semitic abuse of those who speak about the genocide and the ideology that gave rise to it. Supporters of Trifkovic responded to their setback with a campaign of personal defamation directed against members of the IRGC. The anti-Muslim hate-site ‘Gates of Vienna’ denounced the IRGC as ‘Jew-haters’, though without being able to quote a single anti-Semitic statement made by any of its members. This smear was a repeat of one levelled by Trifkovic himself against Professor Emir Ramic, the IRGC’s chairman, on the website of an extreme right-wing organisation, ‘The Lord Byron Foundation for Balkan Studies’, run by former Canadian ambassador James Bissett. Trifkovic accused Ramic of being a ’Jew-hating jihadist’ - again, without being able to produce a single piece of evidence that Ramic was either anti-Semitic, or that he supported jihad [since the articles in question are extremely libellous, I'm not going to link to them]. The basis for the accusation was the claim that Ramic was a member of the editorial board of a Bosnian journal called ‘Korak‘, that has published some viciously anti-Israel articles. The articles in question were, indeed, viciously anti-Israel. But Ramic is not a member of the editorial board of the journal in question, so the accusation is totally false. The second basis for the accusation is that Korak‘s editor, Asaf Dzanic, is a member of the IRGC’s board of directors. Yet, as anyone can see from the IRGC’s website, its board of directors is very large and diverse, numbering over 120, and includes several eminent Jewish members, including the famous Holocaust survivor Elie Wiesel. Most of these members, including Dzanic, are in the capacity of an ‘International Team of Experts’. The website also carries a powerful defence of the IRGC from the smears of Trifkovic and the ‘Lord Byron Foundation for Balkan Studies’, written by the Israeli writer Marjan Hajnal – also a member of the IRGC’s board of directors. The smearing of the entire institute as ‘Jew-hating’ and its director as ‘jihadi’ is, therefore, a desperate clutching at straws on the part of the Srebrenica deniers. ‘To claim that the traditional Right is “anti-Jewish” is to imply that it is gripped by an irrational prejudice. Such accusation is untrue and unfair. It is true, however, that the traditional Right is inevitably antipathetic to certain modes of thought and feeling, to a peculiar Weltanschauung and the resulting forms of public and intra-communal discourse, which are quite properly perceived as specifically Jewish. Historically, Talmudic Judaism’s insistence on the Jews’ racial uniqueness — emphasized by the ritual and dietary laws of Talmudic Judaism and on its view of Christians as idolaters — has ensured that a Jew steeped in his own tradition could not view traditional European or American conservatism with sympathy. His tradition was a form of elaborate survival mechanism based on the zero-sum view of a world divided into “us” and “them.” The Gentile was “the Other” ab initio and for ever. Thus, Trifkovic and Gorin have no problem with anti-Semitism, but do have a problem with those, like Ramic and the IRGC, that oppose Srebrenica genocide denial. Gorin’s apologia for Trifkovic’s anti-Semitism was made in the course of an article denying the genocide at Srebrenica. Again, unlike Ramic, Gorin is an unabashed anti-Albanian, anti-Croat and anti-Bosniak racist. Commenting on a recent obituary of the Croatian journalist Chris Cviic, a long-standing resident of the UK and recipient of the OBE, which stated ‘He is survived by his widow, Celia, and a son and a daughter’, Gorin commented ‘Yayyyy! More little Ustashas running rampant in the West.’ In response to a story in the British rag-sheet The Daily Star about the alleged activities of Kosovo Albanian immigrants in the UK, entitled ‘Kosovan squatters stole my loo’, Gorin commented ‘Ah, the Albanian specialty: invading someone’s home and stripping it bare. (See Kosovo, Serbia.) Then they get to do it again at the UK government’s expense. What the hell are they going to do with the toilet? Do they even know what it’s for?’ Racists like Gorin typify the Srebrenica deniers. Another Srebrenica genocide denier, Nebojsa Malic of Antiwar.com, has also made racist statements about Albanians, describing them as ‘medieval barbarians‘. Srebrenica denial and anti-Semitism frequently go hand in hand. 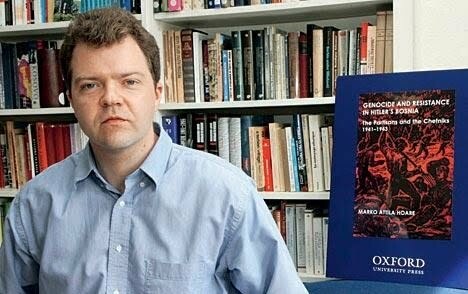 The anti-Semite, Holocaust denier and associate of Julian Assange who goes by the name of ‘Israel Shamir’ is a Srebrenica denier and has written ‘Many war atrocity stories are just stories – from Srebrenica to Kosovo “killing fields”, from Saddam Hussein’s WMD to Belgian babies on German bayonets of the WWI, from Kuwait’s incubator to anti-communist inventions of the Black Book.’ Shamir was one of a group of Srebrenica deniers, including Edward S. Herman and Diana Johnstone, who wrote an open letter to the Serbian parliament calling on them not to recognise the Srebrenica massacre. Srebrenica genocide denial tends to go hand-in-hand with the denial of the genocidal crimes carried out by Serbian Nazi quislings and collaborators during World War II. When the Milosevic and Karadzic regimes waged their war for a Great Serbia in the 1990s, a major element in their propaganda was the equation of the entire Croat and Bosniak nations with the Ustashas (Croatian fascists) of World War II. The reality was that the Serb, Croat and Bosniak nations during World War II were all divided between anti-fascists and quislings or collaborators. Thus, the Nazi-quisling camp included Croat Ustashas, Serb Nedicites and Ljoticites and Muslim soldiers of the SS Handzar Division, while the anti-fascist Yugoslav Partisans comprised Serbs, Croats, Bosniaks and others. But the Great Serbian nationalists of the 1990s waged a hate-campaign against Croats and Bosniaks, seeking to equate the entire Croat and Bosniak nations with the Ustashas. One man who saw through this propaganda early on was the Jewish American medical doctor Philip J. Cohen. As Philip told me when I met him back in the mid-1990s in the US, he approached the Bosnian genocide as a Jew who knew the history of the Holocaust and the failure of the world to prevent it, and felt strongly that something similar should not be allowed to happen again. He was not in the slightest bit taken in by the Serb-nationalist campaign to equate all Croats and Bosniaks with the Ustashas, and responded to it by researching and writing the book Serbia’s Secret War. This book traced the history of anti-Semitism in Serbia and the role of Serbian quislings and collaborators in the Holocaust. It therefore demolished the myth that in the former Yugoslavia, it had only been Croats and Bosniaks who had produced quislings, or engaged in anti-Jewish actions. And although Cohen was not a professional historian or academic, the book is very good. Needless to say, Cohen does not in any way deny the crimes of the Croatian Ustashas against Jews, Serbs or others. But his exposure of the crimes of Serbian quislings against Jews in World War II led to his being the subject of an anti-Semitic denunciation by a Serb nationalist writer called Vasilije Todorovic, who published an open letter in 1996 claiming (falsely) that ‘Cohen, this self-serving Jew, has even managed to condone the killing of 60,000 Jews in WW II, by the very Croatians from whom he receives his major support. I believe you Jews call this, Chutzpah!’ And ‘How astonishing that for 46 years the Roman Church and its Vatican failed to recognize Israel. Now this upstart Jew, Philip Cohen, defends their actions.’ Todorovic extended his attack on Cohen into a general diatribe against Jews: ‘There are no Spielberg movies made about these brave Serbian families who saved Jews. At the opening of the Holocaust Memorial Museum, Serbs were totally ignored as the Museum honored a Roman Catholic woman for saving the lives of 6 Jews.’ Furthermore, ‘Cohen omits the documents that reveal that Jews also joined the Ustasha and the Partisans and murdered numerous loyalists Serbs. In Cohen’s personal secret war against the Serbs, no mention is made that many of the Croatian Nazi officers had Jewish wives.’ And so on. Savich claimed that Serbia’s Secret War had actually been written by a Croatian historian called Ljubica Stefan. He offered not a shred of evidence for his allegations. I can personally testify that Cohen is the author of Serbia’s Secret War. At the time he was writing it, I met him at a seminar at Yale University, where I was studying at the time, and he asked me to assist him in working on the manuscript to his book. Consequently, I read his manuscript, made comments on it, then stayed with him at his home for two or three days and helped him work through some of the documents he had yet to analyse. Although Philip did not read Serbo-Croat himself, he told me he had benefited from a lot of assistance, in translating documents, from the Croatian writer Anto Knezevic. Having spoken with him at length and seen his library and archive, I know for a fact that Savich’s allegations are complete fabrications. Savich is himself an apologist for the Nazi-quisling Nedic regime that ran German-occupied Serbia, claiming that it had ‘no choice in the matter of its collaboration’, that it was no different from the Judenraete in occupied Poland and the Soviet Union, and that it played no role in running concentration camps. All these claims are false. So Savich, who has no academic qualifications beyond a Master’s degree and who is an apologist for the Nazi-quisling Nedic regime, accuses Stefan, who was a tenured professor at a Belgrade faculty and who actually protected Jews during the Holocaust, of being a ‘pseudo-historian’ guilty of ‘historical revisionism. The anonymous creep in question challenged me to confirm or deny the truth of his rumours. This sort of malicious gossip always puts us in a difficult position, as however unlikely it is that such rumours are true, we cannot formally deny them unless we know for certainty that they are false. Readers may recall the rumour that former Bosnian president Alija Izetbegovic recruited for the SS during World War II; no evidence has ever been produced to substantiate this claim, so we have to assume that it is false, particularly given the seriousness of the charge. But I cannot say for absolute certainty that it is untrue. However, having now researched the matter, I can say for absolute, 100% certainty that Biserko’s brother was not a member of the Croatian armed forces, and was not killed in combat with Serb forces. He was not even present in Croatia during the war. As for the claim that Sonja is ‘Croatian’ rather than Serbian; since she is a Serbian citizen, was born in Belgrade and since her father was an ethnic Serb, the smear entirely rests on the fact that her mother is an ethnic Croat. The suggestion being that any Serb whose background isn’t 100% ethnically pure is ‘not really’ Serb at all. The idea that someone’s patriotism can be called into question on the basis of their ‘alien’ ethnic background has been a favourite of the far right since the Dreyfus Affair. In reailty, people from ethnically non-Serb or mixed backgrounds, including ethnic Croats and Bosniaks, have often become hardline Serb nationalists, or supported the Milosevic regime – examples are Emir Kusturica, Jovan Zametica, Franko Simatovic and Mihalj Kertes. The Serbian fascist leader Vojislav Seselj was frequently accused of being an ethnic Croat, on the grounds that ‘Seselj’ is a Croat surname – he was pathetically reduced to obtaining a certificate from the Serbian Academy of Sciences and Arts (for which he allegedly paid a small sum in deutschmarks) to ‘prove’ he was ‘genuinely’ Serb. As a footnote, the smear against Sonja was posted on the ‘Aaronovitch Watch’ malicious-gossip site, about which I have recently written, and is entirely characteristic of the sort of material that is posted there. Biserko’s smearer was actively encouraged to post malicious rumours about me as well by the blog’s proprietor, the Guardian columnist and Credit Suisse stockbroker Daniel Davies (interestingly, Credit Suisse is the same company for which the late Richard Holbrooke worked). Evidence suggests that Davies may not be entirely neutral in former-Yugoslav matters; he has spoken of his friendship with the blogger Splintered Sunrise, a sympathiser of the neo-Nazi Serbian Radical Party; and of Christopher Deliso, author of a viciously Islamophobic propaganda tract about Balkan Muslims significantly entitled The coming Balkan caliphate (which I have dissected), which itself draws heavily on the ‘work’ of Srebrenica genocide deniers, in particular Darko Trifunovic, but also Nebojsa Malic. Davies has also stated that during the war in the former Yugoslavia, ‘I actually had a certain amount of sympathy for the Serbian Republic (though not the Bosnian Serbs)’. Davies’s friend Splintered Sunrise has himself described Biserko as an ‘agent of imperialism’ in a comment on the Lenin’s Tomb blog (the comments are no longer visible online, but I possess the print-out). A further example of demonisation and character assassination that is entirely characteristic.